It takes me about 8 minutes to walk from my house to McMenamins Edgefield. I love having the gathering spot so close, especially when we have visitors and the weather is cooperating. It is great to walk over, get a beer and stroll the grounds. Edgefield brews its own beer, and also has a winery and distillery on its 74 acres. These vines that are right out front are some of the many that can be found on the property that supply the grapes for the wine making. You've captured some lovely color! We have an increasing number of vineyards here in south TX. 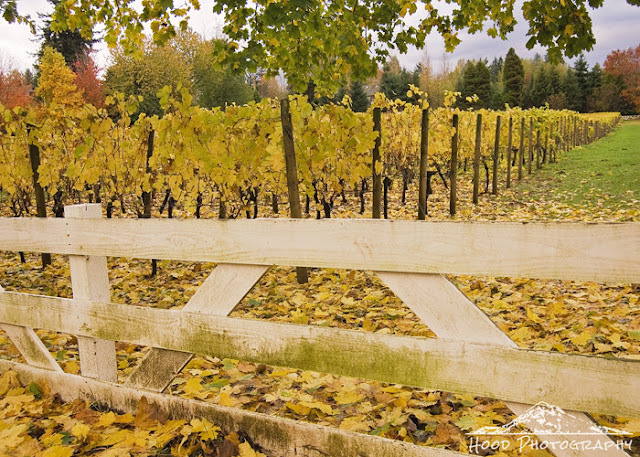 I love the colors the vines turn in the fall. I LOVE wineries! What a wonderful Fall photo! Beautiful piece of earth to walk on. I can imagine a long, leisurely stroll there with some hot cocoa. Thank you for joining us on The Maple Hill Hop! Beautiful scene, the colors are lovely. Have a happy day! So very pretty, I could spend all day there. Autumn vines look so enchanting. These are a glorious golden yellow. On my last trip and stay in Portland I stayed overnight at the converted school that is run my McMenamins (I believe it was the Kennedy School)...I absolutely loved it; the food was great, my room was interesting, and I enjoyed the thought that went into the planting of the grounds.